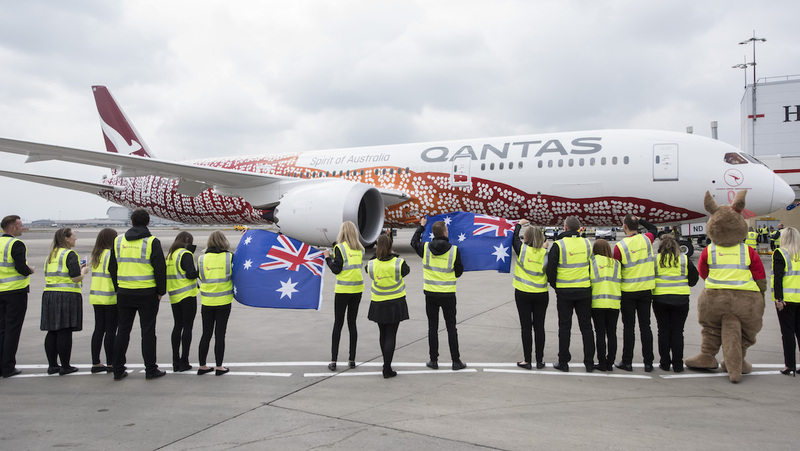 Qantas chief executive Alan Joyce says the first year of operations for the airline’s nonstop Perth-London Heathrow service has proven the concept of a Western hub for nonstop flights between Australia and Europe. The world’s third-longest nonstop flight by distance recently celebrated its one-year anniversary, having commenced on March 23 2018 when Boeing 787-9 VH-ZND operated the inaugural QF9 from Perth and landed at London Heathrow some 17 hours later. 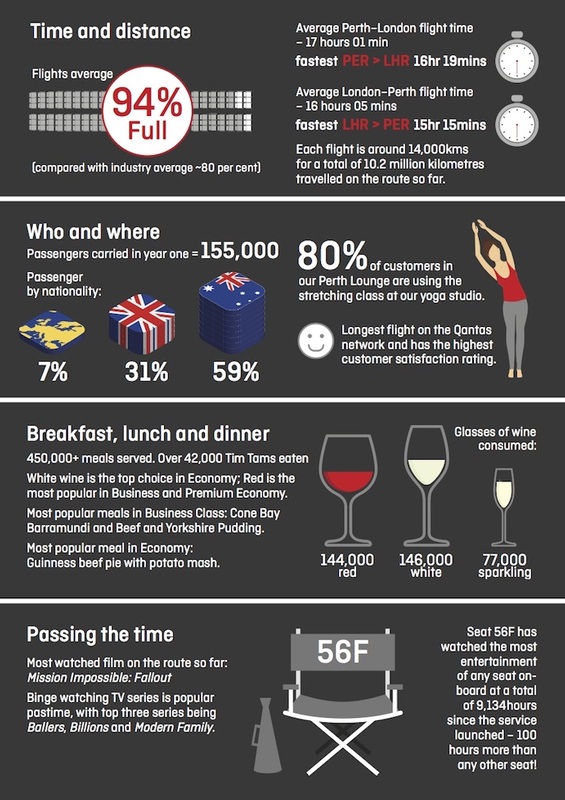 Figures released by Qantas on Tuesday showed that in the 10 months between April 1 2018 and January 31 2019, the QF9/10 operation carried 134,735 passengers – 67,298 on the outbound QF9 and 67,437 on the inbound QF10. The flights achieved average load factors – an industry term for how full the flights are – of 93 per cent and 95 per cent, respectively. 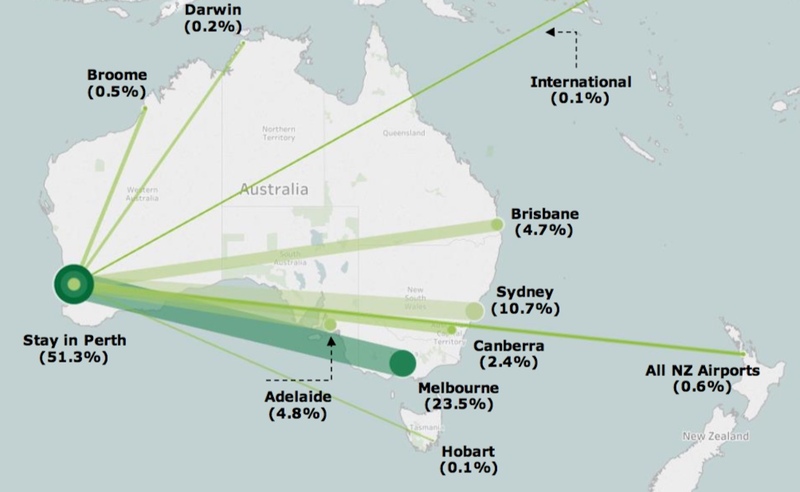 A Deloitte Access Economics report commissioned by Qantas noted passenger load factors on comparable flights between Australia and the United Kingdom ranged from 83 per cent to 86 per cent, based on Bureau of Infrastructure, Transport and Regional Economics (BITRE) data. Perth-London Heathrow represents something of a beachhead for Qantas, with the success of the flight potentially spawning new nonstop services from Perth – described by the airline as its new western hub – to other points on the European continent. Joyce, who was in Perth on Tuesday to mark the one-year anniversary of QF9/10, said the first year of QF9/10 showed that having a hub in Western Australia connecting Australia to the world was working really well. “We have people coming from the east coast to join the flight and it’s made it a lot easier for people in Europe to visit Australia,” Joyce said in a statement. The timing any additional Qantas nonstop flights from Perth to Europe would depend on how Qantas manages its 787-9 fleet, which currently sits at eight aircraft and is expected to grow to 14 by the end of 2020. Those additional six aircraft will lead to the withdrawal of the Boeing 747-400/400ER fleet. Then there the current dispute with Perth Airport, which has launched legal action against Qantas in December to recover what it said were $11 million in unpaid aeronautical charges from Qantas. The airline had described the airport’s new pricing structure as “unjustified”. Earlier in 2018, Qantas dropped plans to operate seasonal services from Perth to Johannesburg after being unable to reach an agreement over terminal access. Negotiations with Qantas to operate the Perth-London Heathrow nonstop flight from its Terminal 3/4 precinct were also hard fought. The airport and airline are also continuing to negotiate over the terms of relocating all of Qantas’s operations at Perth Airport to an expanded international and domestic terminal precinct. Some 30 per cent of seats on the 787-9 are in business or premium economy, the highest percentage of any of aircraft type in the Qantas fleet. By contrast, Qantas’s Airbus A380s that previously operated the daily Melbourne-Dubai-London Heathrow rotation that was withdrawn in favour of 787-9 Melbourne-Perth-London Heathrow have 484 seats. The change of route has meant 248 seats per flight were removed from the market each day. 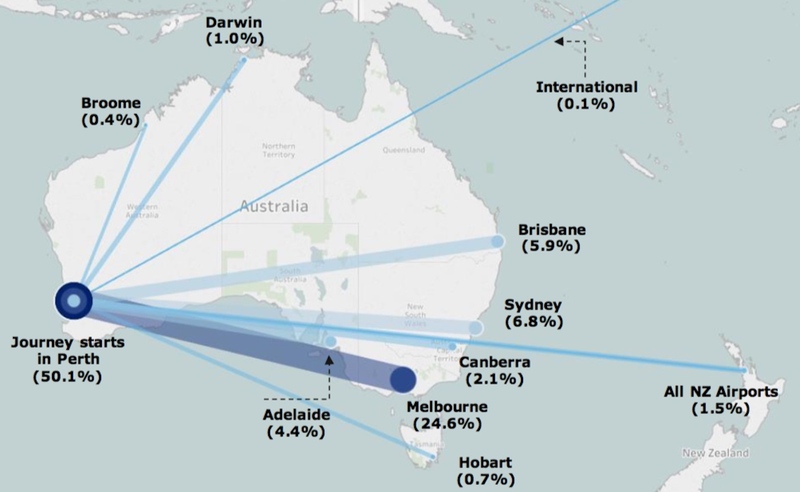 In terms of where travellers were headed, the report said 50.1 per cent of passengers travelling to London on QF9 began their journey in Perth, followed by Melbourne at 24.6 per cent and Sydney at 6.8 per cent. It was a similar story for those arriving in Perth on QF10, with 51.3 per cent of passengers staying in Perth, 23.5 per cent flying onwards to Melbourne and 10.7 per cent going to Sydney. The airline said there had been a 30 per cent increase in the total number of passengers travelling between Australia and London via Perth, including a seven per cent increase in visitors from the United Kingdom travelling to Perth. Joyce said the Perth-London Heathrow service had exceeded expectations. “Almost every flight is full and it turned a profit almost immediately, which is rare for new services because they have start-up costs and it normally takes time to build demand,” Joyce said in a statement. 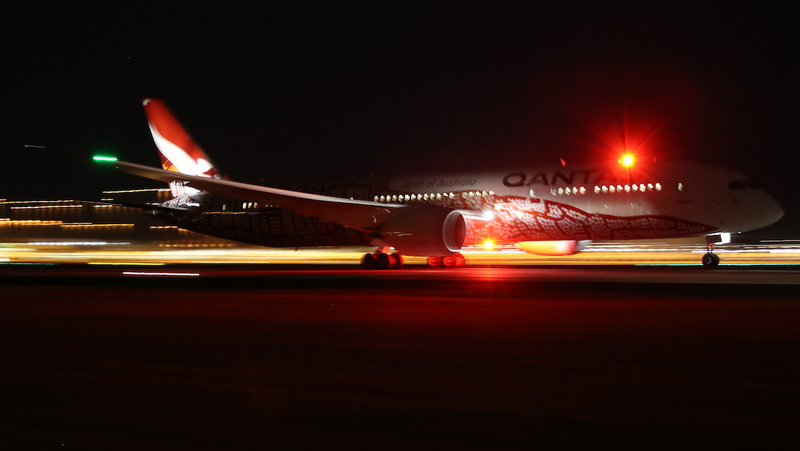 Operationally, Qantas said the quickest QF9 flight completed the journey from Perth to London Heathrow in 16 hours and 19 minutes, 61 minutes quicker than the scheduled journey time of 17 hours and 20 minutes thanks to favourable winds and the airline’s flight planning system. Similarly, the quickest flight on QF10 was 15 hours and 15 minutes, well below the flight’s block time of 16 hours and 45 minutes. “Despite all the complicated logistics and technical challenges, there have been only been four cancelled flights out of 720 planned services for a reliability rating of 99.5 per cent,” Joyce added. The Deloitte Access Economics report said the London Heathrow flight led to a $101.4 million economic contribution, or spending by visitors, to the West Australian economy. “International passengers stayed an average of 22.2 nights in Perth and 5.9 nights in rest of WA, spending approximately $88 and $66 per night, respectively,” the report said. I don’t rate it. Completely shafted Melbourne people. Giving us an inferior product to an inferior hub and reducing capacity, give me the A380 via Dubai anytime, or even via Singapore since they’ve gone there now. Going via Perth is just not interesting, before suffering a flight that far. How many times have you flown the route? I’ve done it twice there and back. It’s not as good as the QF10 via Dubai. I’m going to start flying with Emirates or Cathay Pacific instead. Perth is a seriously sub par hub. Perth is a good Aus link for Melb. ..and quite possibly work best for Qantas to run through these cities onto Bris and Syd, rather than Perth. Would make great sense especially Cairns option. Tourists can see more of Aus without having to go through Singapore, Dubai, HK, or Bkok. With a load factor of 83% – an A380 is carrying 401 passengers, compared to the 96% load factor, and 227 passengers, of a B787 (going off the figures provided above). Not 100% sure that carrying less passengers is a positive. Is it really that more expensive to run an A380 vs the B787 to make a profit? So 484 seats ripped off MEL, and only 24.6% of the 236 seats on the 787 are from MEL. Which is approx 60 pax. If we work on 83% as quoted above on the A380 that’s 400 seats originally from MEL. That says to me that QF has lost 340 pax a day elsewhere… Other airlines like me…? I.e. get there on Cathay or Qatar for 60% the cost or less and at the very least, equally good service. I thought the 787 was a hub buster so what is this hub creation. If you want to hub and develop the regions how about 787 from Broome or Port Hedland getting rid of the regional passengers having to fly in the opposite direction to where they want to go to get an international flight. LOL, “MEL … whine … MEL”. – There is still a Qantas A380 from MEL, connects with QF1 (A380) at SIN. – I’ll bet if SYD had gotten the brand spanking new aircraft if would be “Air Sydney … whine … Air Sydney”. I would say once QF receive their B777X and they can operated to LHR from MEL or SYD direct, Perth just might get the flick! It just suits QF at the moment to operate from PER with the I have to say magnificent 787 ( have had 4 flts on it AIRNZ, QATAR and AVIANCA) Interesting times indeed.